Journey of Hope…from Violence to Healing, an organization led by murder victim family members that conducts public education speaking tours and addresses alternatives to the death penalty, will be at the 18th Annual March to Abolish the Death Penalty on October 28, 2017 in Austin, Texas. Pictured above Journey members hold a banner at the march in 2011. Journey “storytellers” come from all walks of life and represent the full spectrum and diversity of faith, color and economic situation. They are real people who know first-hand the aftermath of the insanity and horror of murder. They recount their tragedies and their struggles to heal as a way of opening dialogue on the death penalty in schools, colleges, churches and other venues. The Journey spotlights murder victim’s family members who choose not to seek revenge, and instead select the path of love and compassion for all of humanity. Forgiveness is seen as strength and as a way of healing. The greatest resources of the Journey are the people who are a part of it. Bill authored a book entitled Journey of Hope…From Violence to Healing, which details the May 14, 1985 murder of his grandmother Ruth Elizabeth Pelke, a Bible teacher, by four teenage girls. Paula Cooper who was deemed to be the ringleader was sentenced to die in the electric chair by the state of Indiana. She was fifteen-years-old at the time of the murder. Pelke originally supported the sentence of death for Cooper, but went through a spiritual transformation in 1986 after praying for love and compassion for Paula Cooper and her family. He became successfully involved in an international crusade on Paula’s behalf and in 1989 her sentenced was commuted to sixty years in prison. Over 2 million people from Europe, mostly Italy, signed petitions that Paula be removed from death row. Pope John Paul II requested mercy from Indiana authorities for Paula. Paula was taken off of death row in 1989 and her sentence commuted to sixty years. Bill, a retired steelworker, has dedicated his life to working for abolition of the death penalty. He shares his story of love and compassion and the healing power of forgiveness. 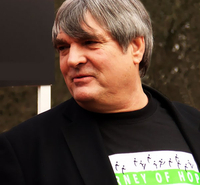 Pelke has traveled to over forty states and fifteen countries with the Journey of Hope and has told his story thousands of times. Bill Babbitt was present at San Quentin prison when at one minute after midnight on May 4th, 1999 the state of California executed his brother, Manny Babbitt. Manny, the recipient of a Purple Heart for his service in Vietnam, was a paranoid schizophrenic who suffered from post-traumatic stress disorder. He had been tried and convicted for the murder of an elderly woman who had died of a heart attack after a break-in and beating. When Bill realized that his brother could possibly be involved in the woman’s death, he contacted the police and helped them arrest his brother. In return, the police promised Bill that Manny would receive the psychological help that he needed and that they would help see that Manny would not receive the death penalty. Bill felt certain that when confronted with the reality of Manny’s mental illness, the justice system would hand down a fair sentence but avoid death. He was wrong. The Babbitt family was too poor to afford good counsel. Manny’s first lawyer took their money and then dropped the case. The second, a court-appointed attorney, refused to allow blacks on the jury, drank heavily during the trial and was later disbarred and sued for racism. Today Bill speaks out regularly against the death penalty. David Kaczynski is the brother of the ‘Unabomber’ Theodore (Ted) Kaczynski. After the anonymous Unabomber demanded in 1995 that his manifesto, titled “Industrial Society and Its Future”, be published in a major newspaper as a condition for ceasing his mail-bomb campaign, the New York Times and the Washington Post both published the manifesto, hoping somebody would recognize the writing style of the author. David recognized Ted’s writing style, and notified authorities. On April 3, 1996, police arrested Ted Kaczynski in his quiet rural shack in Lincoln, Montana. David had received assurance from the FBI that his identity as the informant would be kept secret, but his name was leaked to the media. In addition, he sought a guarantee from federal prosecutors that Ted would receive appropriate psychiatric evaluation and treatment. The Justice Department’s subsequent active pursuit of the death penalty for Ted and attorney general Janet Reno’s initial refusal to accept a plea bargain in exchange for a life sentence was seen as a betrayal by David and other Kaczynski family members, and motivated David to become an anti-death penalty activist. 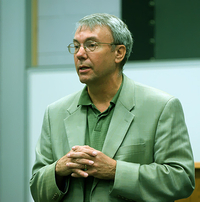 In 2001, David Kaczynski was named executive director of New Yorkers Against the Death Penalty, a coalition of individuals and organizations who seek abolition of capital punishment. He regularly speaks against the death penalty. He is often alongside Bill Babbitt, who was present at San Quentin prison when at one minute after midnight on May 4th, 1999 the state of California executed his brother, Manny Babbitt. Kaczynski has repeatedly said that if it were not for his family’s financial ability to hire competent counsel, his brother, like Manny Babbitt, most likely would have received the death penalty. Instead, Ted Kaczynski received life in prison without the possibility of parole. At the age of 20, Terri‘s son, Justin Wolfe, ex-high school football player and normal, average, all American, suburban kid was sentenced to death in Virginia. In 2016, after he had spent approximately 5,700 days in solitary confinement, he was sentenced to 41 years in prison. Terri heard about a group protesting the death penalty at the US Supreme Court in Washington, DC. and decided to meet those fighting to abolish the death penalty. 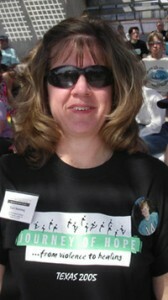 Terri began her own journey to save Justin’s life. She has spoken on many occasions with the Journey of Hope, including during our 2009 Germany tour.